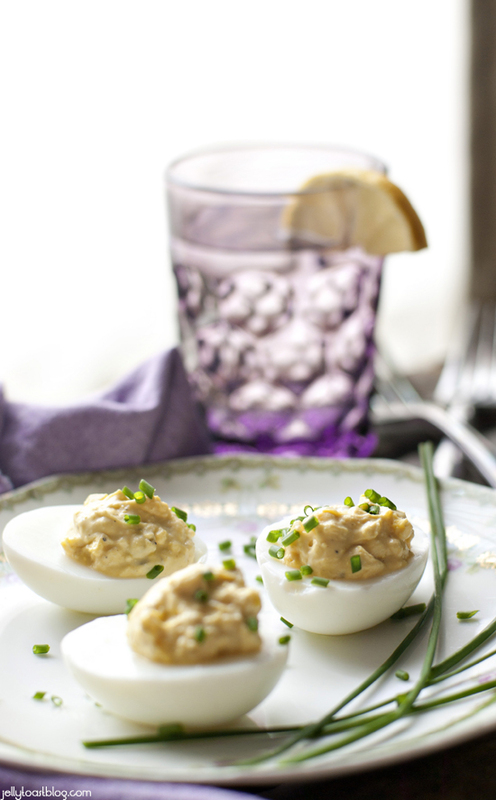 If there is one food that screams Easter to me, it’s deviled eggs. I’m positive that I’m not alone. What else are you supposed to do with all of your delightfully dyed eggs? 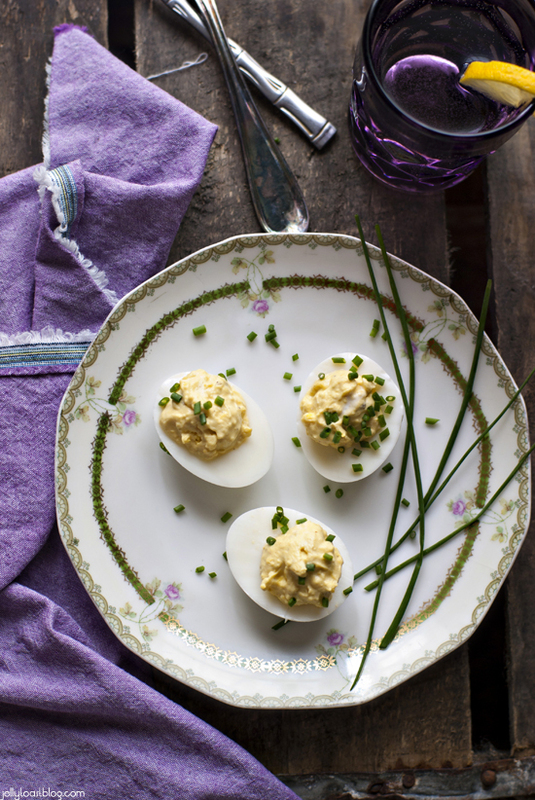 When I was little, I always remember my Great-Grandma Scheuer making deviled eggs on Easter. They were delicious and one of the items that I looked forward to all year. To this day, I still pile my plate high with 3-4 eggs at our Easter brunch. I like to pop ’em like Tic-Tacs. 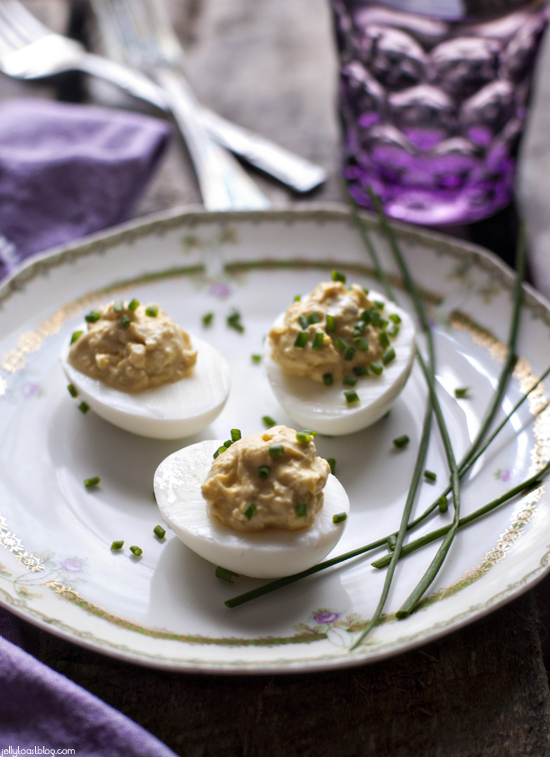 As a side note, why is it that deviled eggs are made primarily around Easter? It probably has something to do with the aforementioned dyed eggs. When you’re lousy with hard boiled eggs, it just makes sense to devil some up, I guess. A few years ago, I got assigned to make deviled eggs for our family’s Easter get together, and I was thrilled! Trying to live up to my great-grandma’s deviled eggs, I made a batch that I thought was just like hers. Now, admittedly I hadn’t actually tasted hers in many, many years and there wasn’t a written recipe anywhere, so I relied on my memory for the recipe. I added some Miracle Whip (yes, I’m that girl who uses Miracle Whip in the place of mayonnaise, like, 98% of the time. What can I say? It’s what I grew up with.) sweet pickle relish, mustard and some salt and pepper. They tasted awesome! I was so pleased with myself. When I took them over to my folks’ house for our Easter get together, everyone loved them (thankfully) but everyone was wondering what I had put in them. Even my grandma (my great-grandma’s daughter, mind you, who grew up on her mother’s deviled eggs) loved them, but was wondering what my secret was. By this point, I was starting to wonder, too, because I had been so (foolishly) confident that they were just like Grandma Scheuer’s. It turns out, though, that my eggs were a bit different, but luckily a good different. I’m pretty sure that my accidental secret ingredient was the relish, or perhaps it was the mustard, although I could have sworn my Grandma Scheuer had put both in hers. Apparently my memory was faulty. All in all, my questionable memory didn’t cause too much of a problem, because as I mentioned, everyone loved them. Phew. At least I didn’t totally drop the ball with the deviled eggs. Ever since then I have been making this slightly altered version of my great-grandma’s deviled eggs, and I think if she could try them, she would definitely approve. As a photo note, this pretty little plate belonged to my Great-Grandma Scheuer and was given to me by my Grandma several years ago for a birthday gift. It’s quite special to me. Hopefully it’s delicate beauty distracts you from the fact that I completely chive bombed that back egg. I mean, seriously. Holy garnish, Batman. I need a chive intervention. This is my method, but the amounts of the added ingredients (Miracle Whip, relish and mustard) can be altered to fit your personal tastes. If you prefer a dryer filling, hold back on the Miracle Whip a bit. My advice would be to add a little at a time and test it. Place eggs in a large pot with a tight fitting lid and cover the eggs with cold water by about 1 inch. Bring pot to a boil over medium high heat. As soon as the water is boiling, cover the pot and remove from the heat. Allow eggs to sit, covered, for 12 minutes. Immediately drain the eggs and plunge them into an ice bath to stop the cooking process. Peel the eggs and cut them in half length wise. Remove the yolks to a medium size bowl and reserve the egg whites onto a platter. To the yolks, add the Miracle Whip, mustard and relish and season with salt and pepper. Mix well with a fork. Using a small spoon (or piping bag if you’re feeling fancy) scoop the yolk mixture back into the egg whites, dividing the filling evenly among all of the whites. Garnish with chives or paprika (if using). 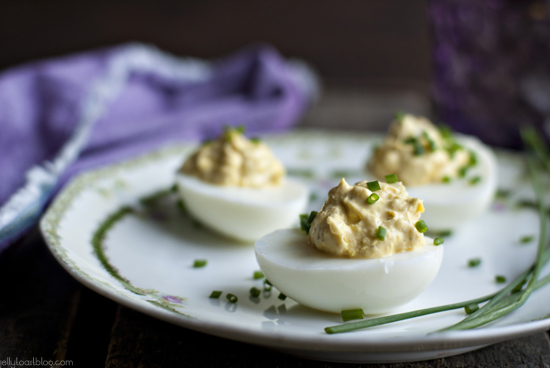 Cooking Note: If you are making the deviled eggs a head of time, keep the yolk mixture and egg whites in separate refrigerated containers and fill just before serving. 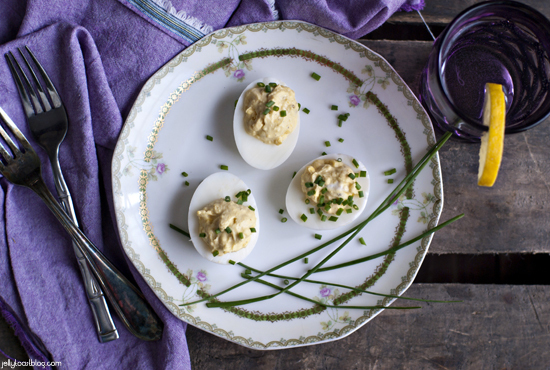 I love the pretty green that that chives add…and I’m basicallly a deviled egg addict too. Not the world’s sexiest food, but good gracious they are yummy!! Definitely not an inherently beautiful food, I agree. I’m glad to have a fellow deviled egg fan!